If you want to reduce parking requirements while planning a new residential or commercial development, you currently have parking capacity problems, or you’re just looking to provide an additional valuable service to your residents, GoCar is the perfect solution. Carsharing reduces car ownership & car dependency, congestion, noise and air pollution. Planning Permission - the inclusion of a Car Club could increase the likelihood of gaining the most optimal planning permission for your project. Cut build costs and reduce construction time by reducing the parking requirements within your project. Helps increase walking, cycling, and use of public transport. Allows individuals to have the benefits of a private car, without having the large costs and hassle associated with car ownership. In a city, an individual underground parking space can cost anywhere from €25,000 - €100,000 each to build – an expense which is fast becoming unsustainable for developers and management companies. In other European cities, including Car Clubs at the planning permission stage in Mobility Management Plans has allowed planners and developers to reduce the level of parking per unit and the size of the basement required, therefore bringing down construction costs, purchase price and rent levels. Unbundling separates parking costs from rents or housing sale prices, allowing residents to choose how much parking they want – and ensuring that non-car owners do not pay for parking they neither want nor need. Unbundling residential parking costs from the cost of housing can significantly reduce household vehicle ownership and parking demand. Marlet & OCSC were granted permission to reduce basement parking from 112 to 58 spaces in their D2 site by including a car club in their planning application, which the Sunday Times covered here. 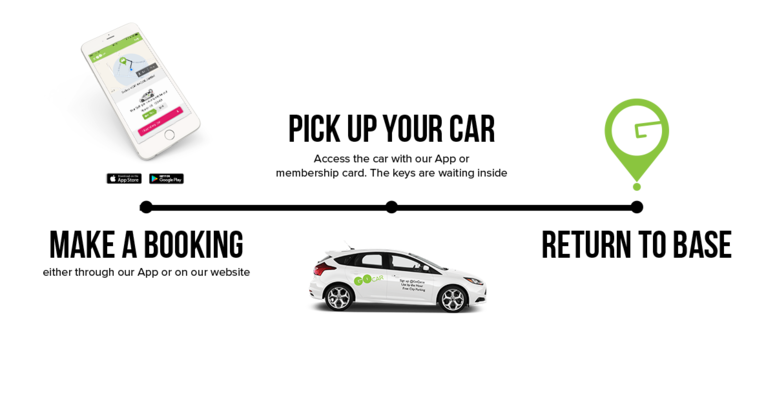 Each GoCar replaces approximately 20 private cars. GoCar members sign up online and send in a photo of their license. After we verify their account, they can then book cars or vans via the website or mobile app. They unlock the car with their phone or GoCard, and the keys are waiting securely in the glovebox. Rates start from €4 for half an hour, with fuel, insurance and maintenance included. We ask the members to return the car how they would like to find it; returned on time, clean, and with enough fuel. If the fuel drops below a quarter, members can use a fuel card in the car to refuel it, which GoCar pays. With pay as you go pricing and no subscription charges, GoCar is ideal for people or organisations who only need occasional access to a car but don’t want to own one, families who need a second car sometimes, as well as others who would like occasional access to a vehicle of a different type than they use day-to-day, like our GoVans. Many businesses use the service as it allows them to access fleet cars, without having a large capital cost on their books.